Evening has arrived and a tangerine-coloured sun sets behind the limestone arches of a 2,000-year-old Roman amphitheatre. Above, seagulls dance on a warm sea breeze—a peaceful contrast to the line of Roman gladiators marching into the arena. The armoured actors and their iron swords prepare to engage in hand-to-hand combat. However, my husband and I are looking for something a little more calming. We stroll past the gladiator re-enactment toward the city’s Roman forum for a glass of chilled Malvasia wine, soft music and a chance to people-watch. You might think I was somewhere in Italy. However, the evening I’ve described took place in a city called Pula, on Croatia’s Istrian Peninsula. Before my husband Shawn and I travelled to Pula on a five-week trip, I’d read descriptions proclaiming Istria to be the “new Tuscany.” Indeed, Istria’s scenic interior—dotted with cypress trees and crimson poppies—does remind me of the alluring landscape outside Florence, where I’ve purchased peppery olive oil and opulent dessert wine and where I’ve enjoyed meals in locals’ homes. But Istria and Tuscany are pleasantly different. 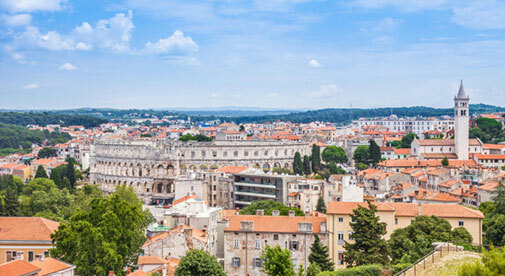 Istria is more affordable, allowing us to live comfortably for about $1,700 a month. It’s also less densely populated than Tuscany. And it’s diverse. You can spend the morning exploring islands or relaxing at the beach and your evening dining on wild asparagus risotto in a hilltop town. You’re about 100 kilometres from Trieste and just a four-hour ferry ride from Venice across the Adriatic Sea (it’s about $100 for day-trip tickets, but ferries only run during the tourist season). Along the coast, pine trees frame azure waters and pebbly beaches, while quiet coves lure snorkellers, kayakers and sailing enthusiasts. Rovinj is the most famous of Istria’s seaside towns, with its lemon, raspberry and ochre-coloured buildings packed tightly into the shape of a snail shell. I loved sipping a cup of bijela kava (Croatia’s version of a latte) in Rovinj while looking out at the sparkling Adriatic, before having a picnic of Istrian cheese and olives and watching the sailboats go by. While Croatian is the official language, young Croatians often speak ﬂawless English and are enthusiastic to practice it with visitors. It’s not just the locals who are welcoming, either. Whether you’re in the city of Pula or in the smallest Istrian town, you’re bound to encounter expats from all walks of life who have carved out new lives here. The region’s pleasant climate makes it possible to enjoy the outdoors all year. Coastal areas like Pula are classic Mediterranean, with maximum temperatures of 27 C in July and lows of 3 C in January. Inland areas with higher elevations see greater temperature differences. Fortunately, you can swim in the Adriatic Sea around Istria from May to October. Also, if you’re an outdoor enthusiast like me, plenty of hiking opportunities exist on the peninsula and cycling trails are easy to find. Renting is straightforward and you’ll find good-value, long-term rentals across Istria. In seaside Rovinj, I saw a listing for a furnished, one-bedroom apartment, complete with a balcony, renting for $700 a month. To the east, in the medieval hilltop town of Labin, a furnished two-bedroom apartment with sea views rents for $630 a month. Expats tell me that rents of $460 to $775 a month are to be expected, depending upon an apartment’s size, condition and how much outdoor space it has. If you’re looking to have a Tuscan lifestyle with a smaller price tag, Istria might make a good home base. Living in a picturesque hilltop town and conducting errands in Pula could prove to be a great combination. One thing is certain: Istria has a wealth of experiences awaiting adventurers looking to live internationally for the short or long term.